You can choose the device you prefer for playing music and overhead messages. The options are our dedicated CloudBox, our free mobile app (iOS, Android and Amazon Fire Tablet) or a web browser on your computer. All of the devices can be controlled remotely from a computer or mobile device. 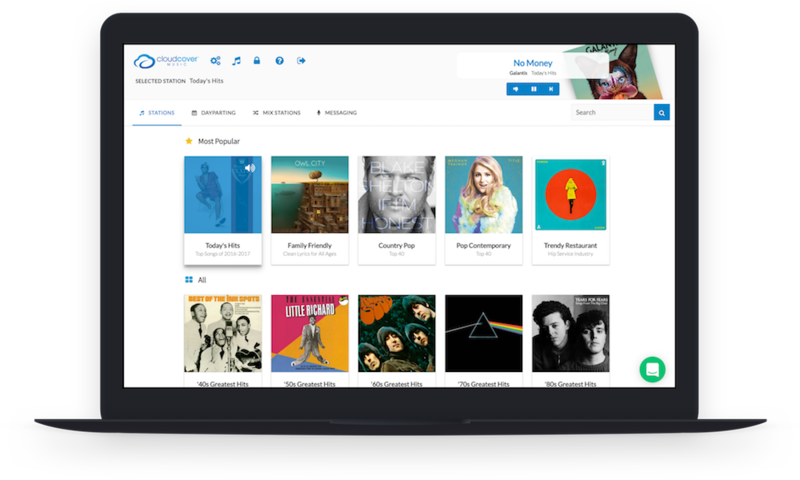 The majority of our customers appreciate having a reliable, dedicated, set-and-forget CloudBox to play music and messages. Once the CloudBox is plugged into an ethernet connection or WiFi is configured, it will connect to Cloud Cover Music and start playing the music or messages you have selected from your account. Purchase price of $84.50 (plus tax & shipping) USD. CloudBoxes are ordered from your Cloud Cover Music account. Stream from a mobile device by connecting through an amplifier, Bluetooth, AirPlay (iOS) or Chromecast (Android). The iOS, Android and Amazon apps are downloadable for free on iOS 8+, Android 5+, and Amazon Fire Tablet. Keep in mind that amber alerts, phone calls and other apps can cause interruptions, so consider disabling other activities on the device that you don’t want your customers to hear! Kiosk Mode is a quick configuration to lock the device and avoid interruptions. Log into your Cloud Cover Music account in a web browser to stream directly to any connected amp or amplified speakers. The computer can be connected using a headphone/line out with RCA into your amplifier or 3.5mm line into amplified speakers. Your computer may also support playing wireless Bluetooth speakers (range 30-60 feet based on manufacturer), Chromecast from Chrome, or AirPlay. See this equipment guide to help understand the options that may best suit your needs. To make things simple, if you operate multiple locations you can create a bookmark (Auto Login URL) for each location that is “click-and-go”, with the stations, mixes and schedules of your administrators’ choosing. Note for Apple Safari browser: tabs that are not in the foreground will “sleep”, so make sure the tab playing music is in its own window! Although Cloud Cover Music does not supply speakers, amps or do installations, we hear from thousands of customers and work with partners all over the US and Canada who can help make recommendations and perform installations. We also partner with Digital Signage companies and work either directly integrated or in tandem with them to be the music and audio message provider. If you need help on considering choices for your speakers and setup, this guide might be helpful to understand the options and weigh the pros and cons. What equipment do I need to use the Cloud Cover Music service in my business? It’s all about choice when it comes to selecting the equipment you use to play Cloud Cover Music at your business. You can choose the device you prefer for playing music. You can play music from our dedicated CloudBox player, our free mobile app (iOS, Android and Amazon) or a web browser on your computer. The music can be controlled from a web browser on a computer or mobile device from anywhere. If you need help on considering choices for your speakers and setup, this guide might be helpful to understand the options and weigh the pros and cons. Does Cloud Cover Music recommend audio equipment and speakers? Speaker and audio equipment selection can vary greatly based on the size of the space(s), sound quality, volume, installation, aesthetics and budget requirements. Due to the wide variety of requirements, we tend not to make specific recommendations. We do, however, have an equipment guide with a variety of speakers options based on the streaming devices. Also, we have partnerships with installers and equipment manufacturers throughout the United States and Canada for larger multi-location installations. Please feel free to chat with us online or by phone. What makes the CloudBox the best choice for my business? From its super-sleek design to reliable streaming technology, the CloudBox is a good choice for businesses who want an easy-to-use, affordable way to ensure uninterrupted playback of music at their businesses (even when the internet goes down). For more information on the benefits of using the CloudBox – and additional details on all of your device options, click here. How much does the CloudBox cost? The CloudBox is priced at $84.50 (plus tax & shipping). It’s a one-time charge with no hidden costs or add-ons required. Is there a product warranty included with the CloudBox? The CloudBox is a well-constructed piece of streaming technology. However, if for any reason, anything goes wrong with your CloudBox device it comes with a 12-month warranty for manufacturer defects (the period begins at the date of shipping). How much bandwidth do I need to stream music with the CloudBox? The minimum bandwidth is 384Kbps per device. If streaming for 24 hours, this is approximately 1.5-1.8GB of data. A schedule can be set to play during specific hours, if data consumption is a concern. For example, playing just 8 hours a day would be around 500MB of data. Scheduling is a standard feature on all plans. Can I connect the CloudBox via Wi-Fi? Yes – and it’s easy to do as well. The CloudBox can connect to the Internet through an Ethernet cable or Wi-Fi connection. To connect the CloudBox on Wi-Fi, you can follow these instructions. Does the CloudBox work with PoE (Power over Ethernet)? The CloudBox can be powered from the USB port, so a USB PoE Splitter can be purchased, which can then power the CloudBox and provide an ethernet network connection. If I experience an outage can I continue to stream music with Cloud Cover Music? One of the key benefits of using the CloudBox is that the device has locally stored music, which will begin to play when the CloudBox loses its internet connection. As soon as a connection to the internet is reestablished, the CloudBox will resume playing your selected station. I don’t currently have internet connectivity at my business. Can I still stream Cloud Cover Music? You must have a live internet connection in order to stream our music. Some of our clients who do not have an internet connection at their business, however, use cellular data to take advantage of the Cloud Cover Music service. What are the bandwidth requirements and data usage for Cloud Cover Music? Does Cloud Cover Music work with wireless speakers? Cloud Cover Music works with both Bluetooth and Wi-Fi speakers. Not all wireless speakers are built equally, so here is a guide to explain some of the considerations and examples of some common brands that our customers use. Bluetooth speakers are limited by range from the streaming device it is connected to. Wi-Fi speakers are limited by range of the wireless network that the speakers are connected to. Does Cloud Cover Music recommend speakers? Does Cloud Cover Music work with AirPlay and AirPlay 2 (speakers, receivers and Apple TVs)? Yes. 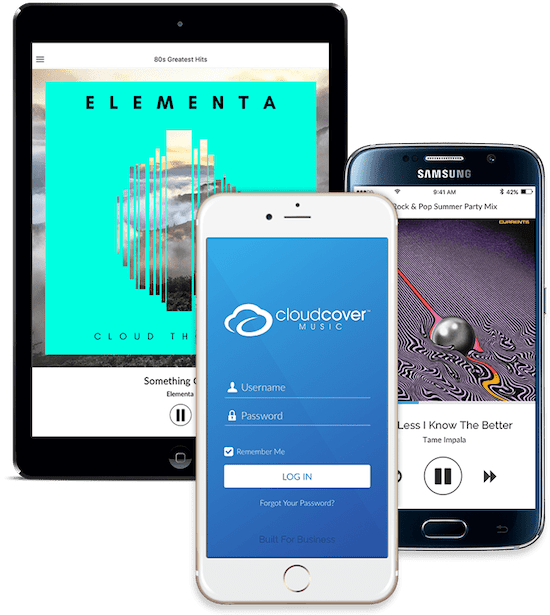 Cloud Cover Music can be streamed using the Cloud Cover Music app on an iOS device to an AirPlay speaker or AirPlay supported device such as a receiver or Apple TV. This also works from a Mac computer when streaming from a browser. Recently released, Apple AirPlay 2 allows multiple AirPlay 2 devices to be selected for streaming. This means one Cloud Cover Music stream can be played on multiple speakers/devices simultaneously. When used in combination with Cloud Cover Music Zones, you can switch between playing the same stream or different streams of music on your AirPlay 2 devices. AirPlay 2 is now supported on iOS 11.4 and on Mac computers using the latest Mac OS X. There are many audio vendors supporting AirPlay 2 with many more releasing products in the near future. Can I use the Bose Speakers (Soundtouch) with Cloud Cover Music? Yes. Cloud Cover Music can be streamed from any device (CloudBox, Mobile App, Tablet App or Computer browser) to one or more Bose SoundTouch speakers using BlueTooth or AUX to WiFi. Bose SoundTouch speakers can be grouped together using the SoundTouch app to "play everywhere". More info here. Bose have a SoundTouch Wireless Link Adapter which can be used to group speakers by WiFi or BlueTooth and also enable an audio out that can connect to any other, perhaps older sound system or on-premise on hold system. Also, Bose have recently announced they and many other companies are working on AirPlay 2 speakers, which would enable multiple speakers to be selected and streamed over a wireless network from an iOS or Mac computer. Watch this space! How about Libratone products? Are they compatible with Cloud Cover Music? Libratone products and Cloud Cover Music are most definitely compatible! Libratone offers easy set up, and you can use up to 6 of their high-quality speakers on the same Wi-Fi network. Given the quality of the Libratone line of products, the company offers an affordable solution that features 360-degree sound (versus directional) for a richer listening experience, and they are portable with good battery life too. Libratone have recently announced that they have support for Apple AirPlay 2. AirPlay 2 allows iOS devices and Mac computers to select and stream to multiple AirPlay 2 devices (Speakers, Receivers, Apple TV's) at the same time. If you combine this with the Cloud Cover Music Zones capability, then you can choose what zones you want streaming on what AirPlay 2 devices, so you can have the same music or different music on any or all speakers! Can I use Sonos with the Cloud Cover Music service? Our service works great with the Sonos product line! For more detailed information about how to stream Cloud Cover Music using Sonos speakers, click here. Is Cloud Cover Music compatible with commercial grade Network (PoE) speakers? Yes. Cloud Cover Music has customers using network speakers in the ceilings and mounted throughout shopping centers, hospitality conference locations and restaurants. Companies such as Axis Communications make commercial speakers for these types of applications. The simplicity of PoE (power over ethernet) driven network speakers simplifies the installation and management, as well as making sure the power stays up using a UPS on the PoE switch in the communications room.